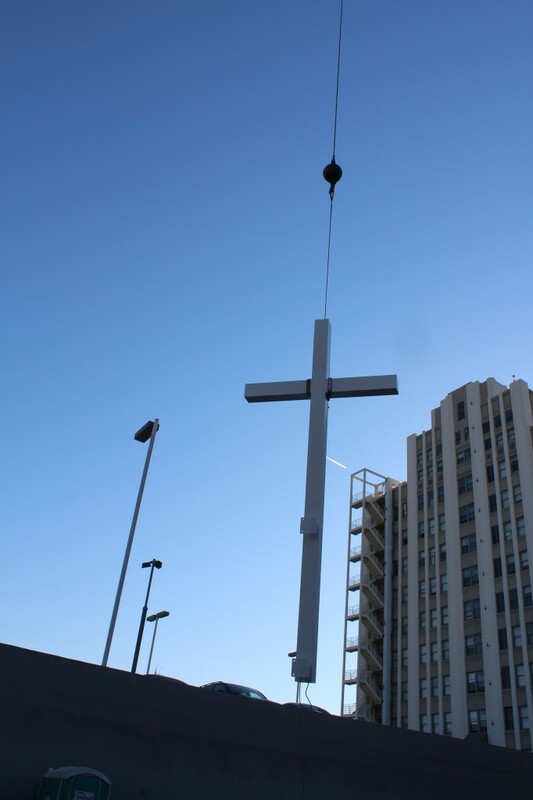 On Sunday, October 13th the congregation visited the new Church site for a tour and blessing of the cross. 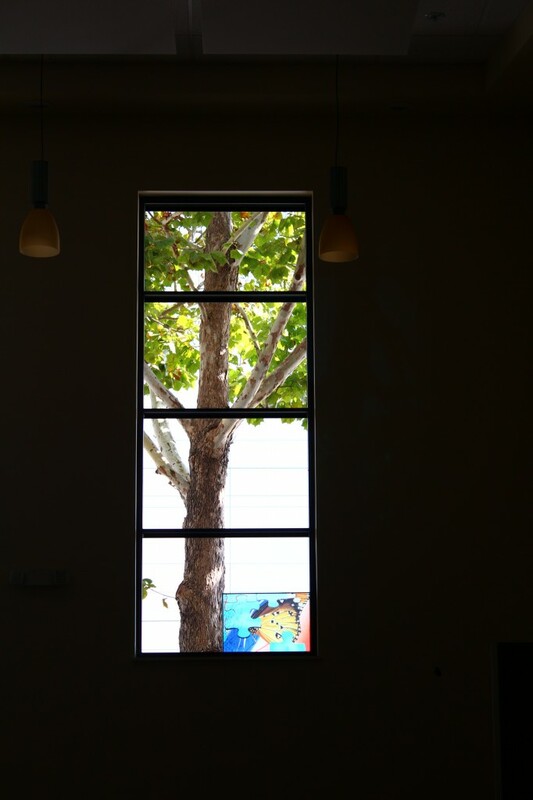 The picture below was taken as the congregation formed a Circle of Inspiration after the blessing. 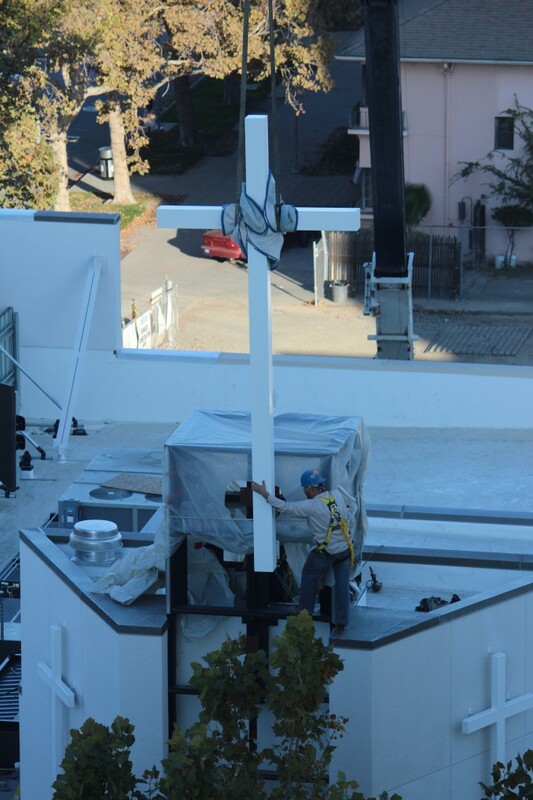 On Monday, October 14th a crane arrived at 24 North Fifth to install the final roof railing for the roof deck and the cross. 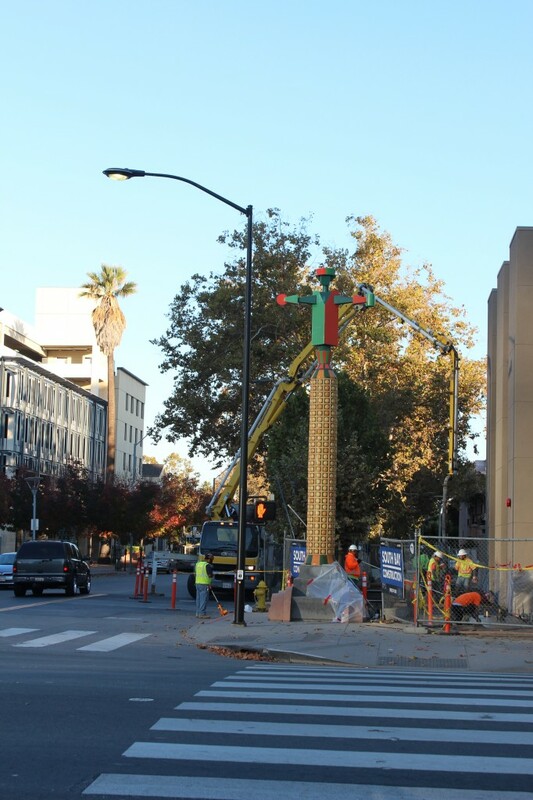 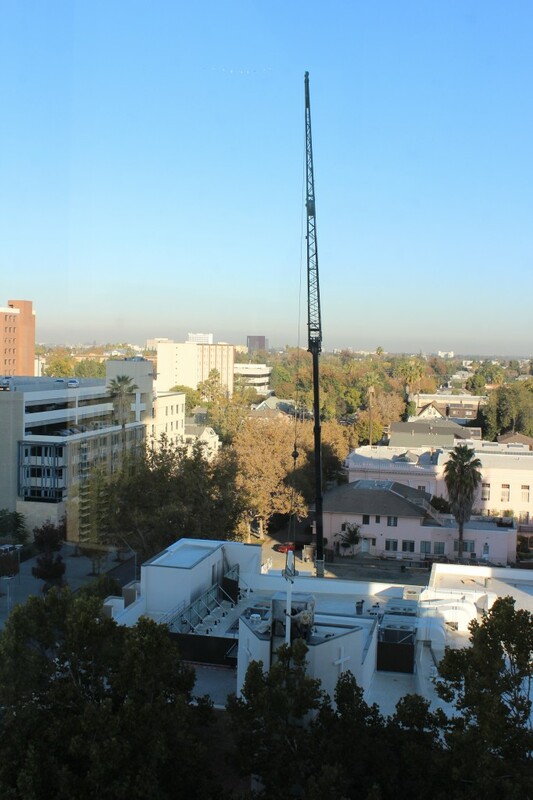 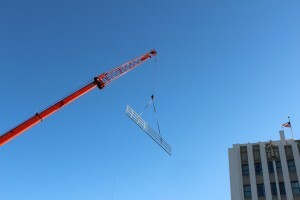 Pictures of the crane set-up were published in a previous blog, and are HERE. 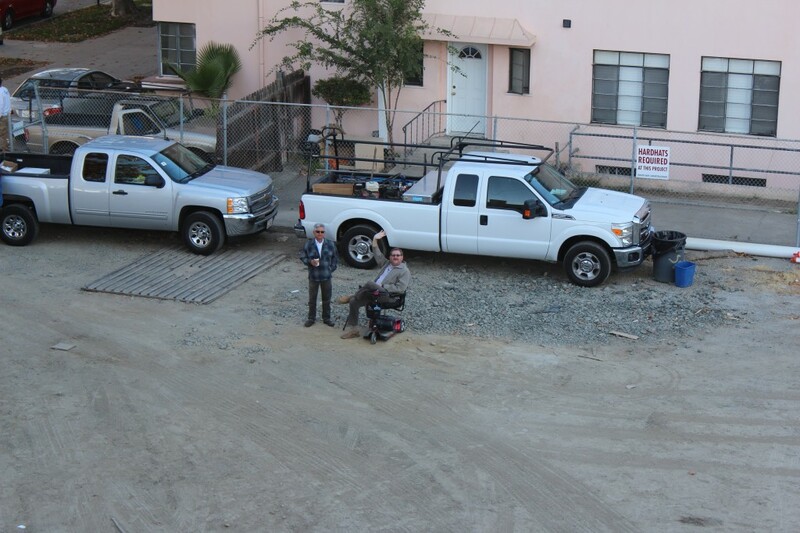 Everyone was very pleased to see Jim Crawford at the site. 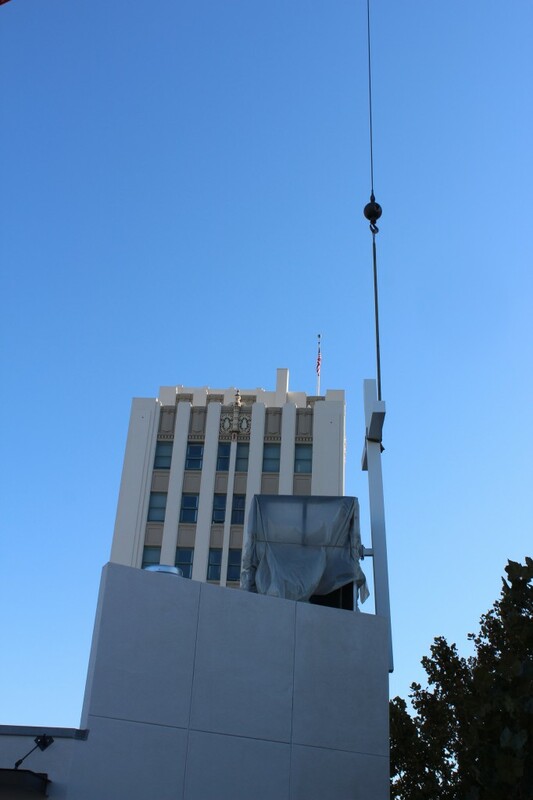 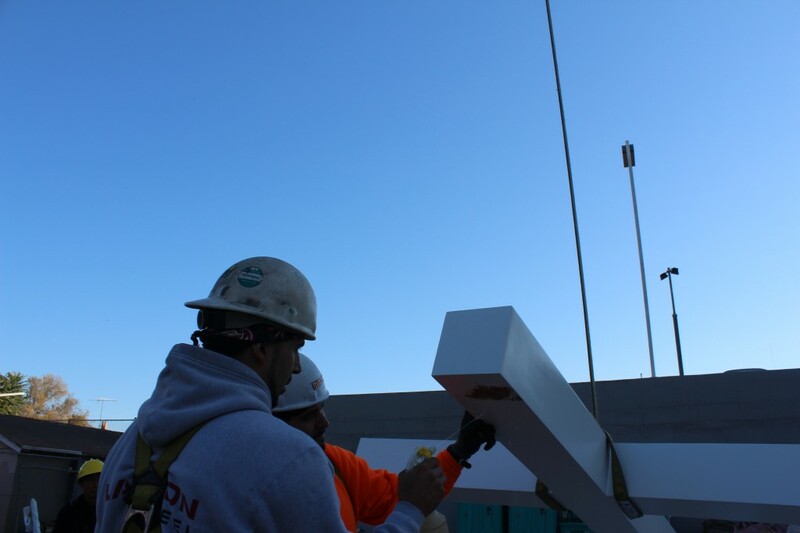 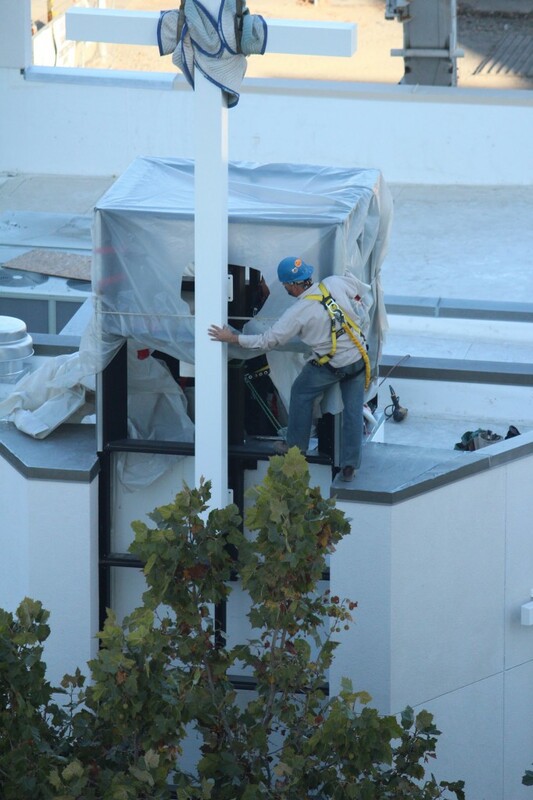 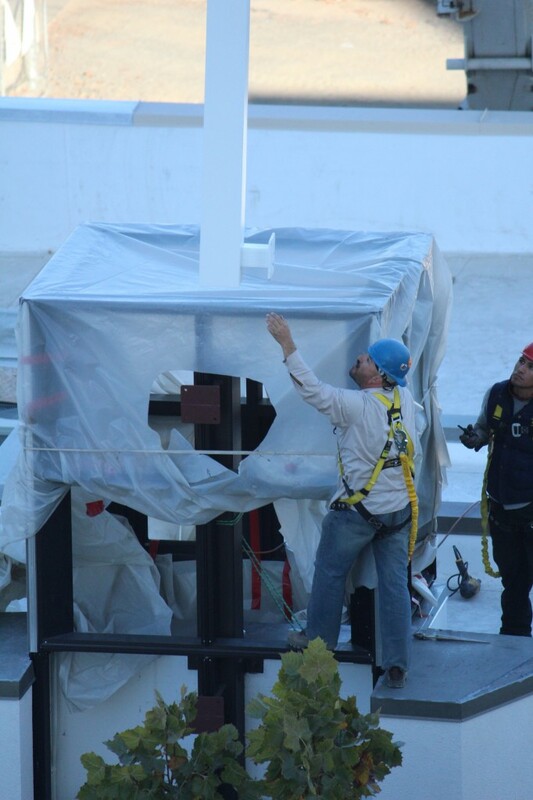 The pictures of the cross being raised from the staging area to the top of the cross tower are below. 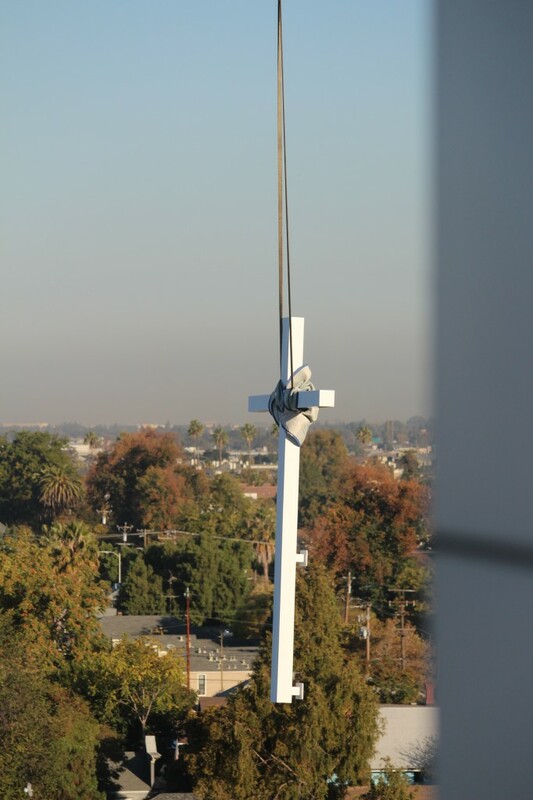 The rigging team found a small mis-alignment between the bracket on the cross and the structural component supporting the cross. 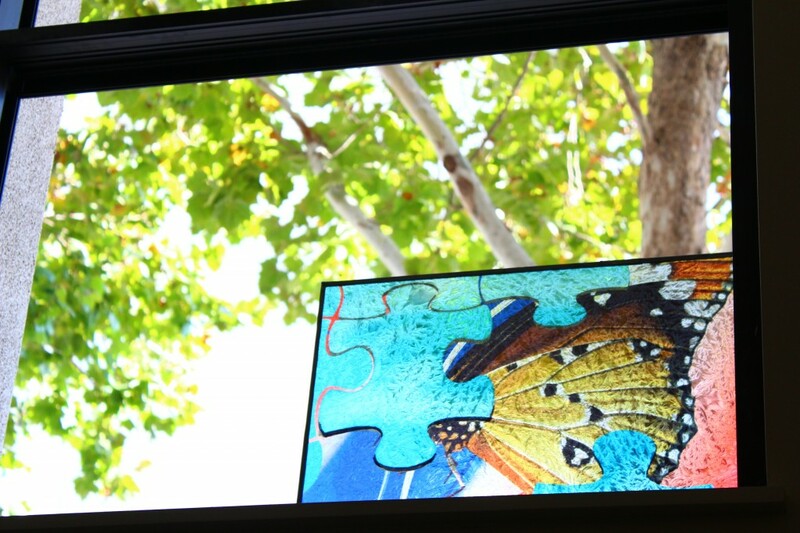 A decision was made to re-work the bracket rather than modify it in-place. 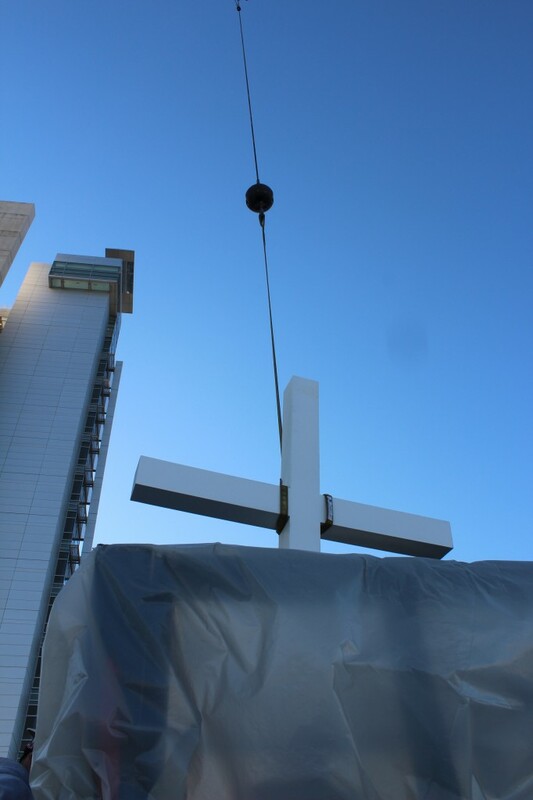 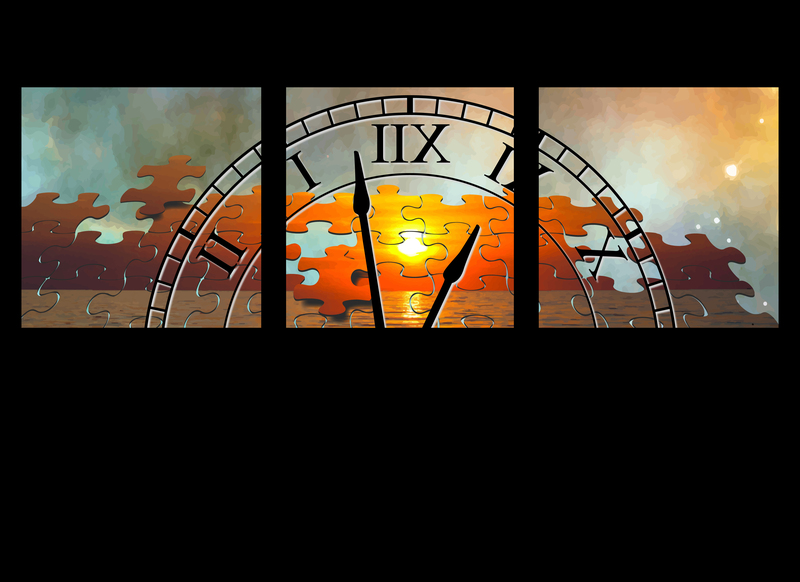 The cross is expected to be installed on Friday, October 18th. 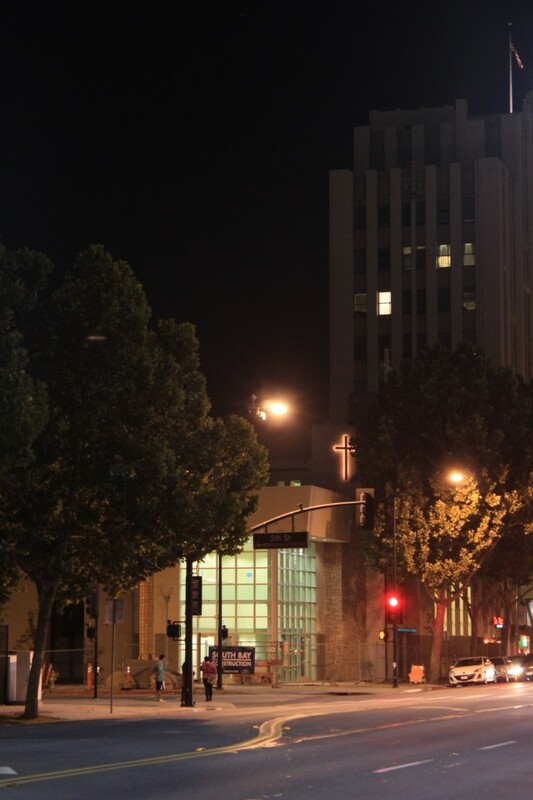 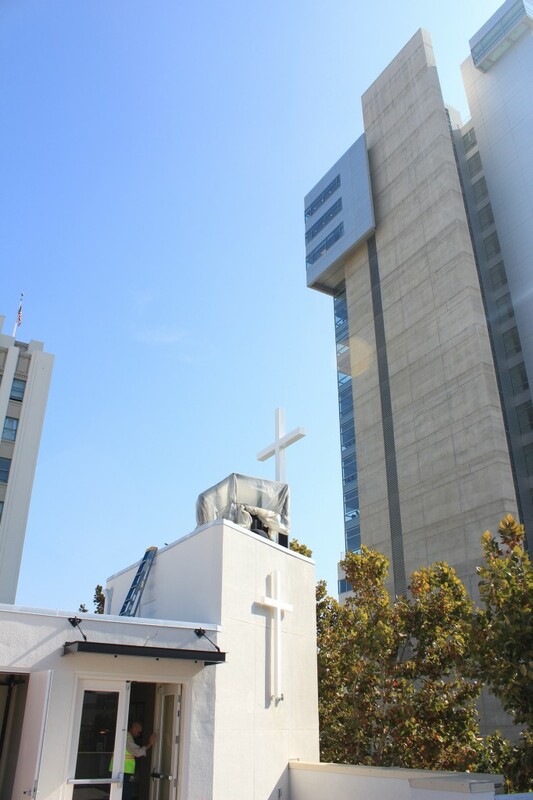 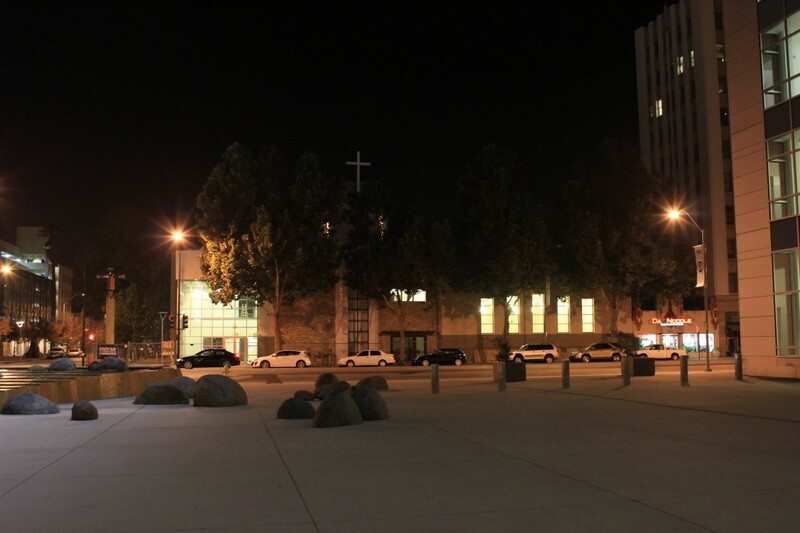 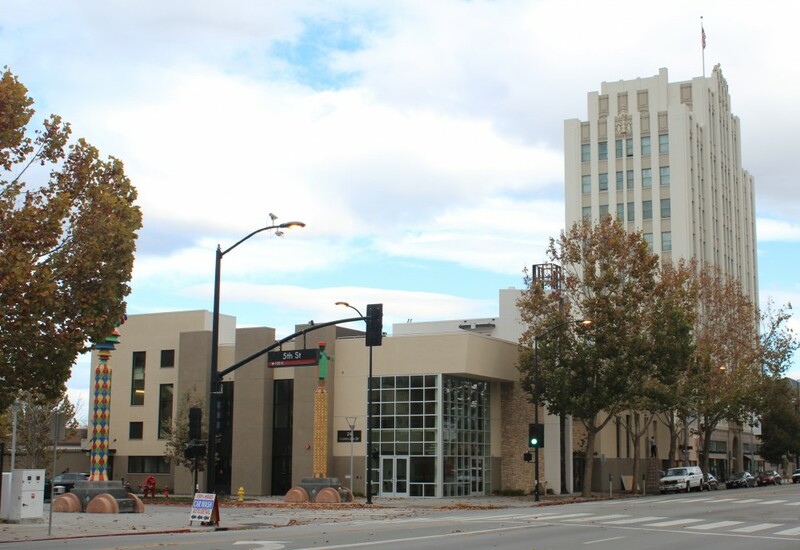 You can read more about the history of the Church in Today’s San Jose Mercury News Article. 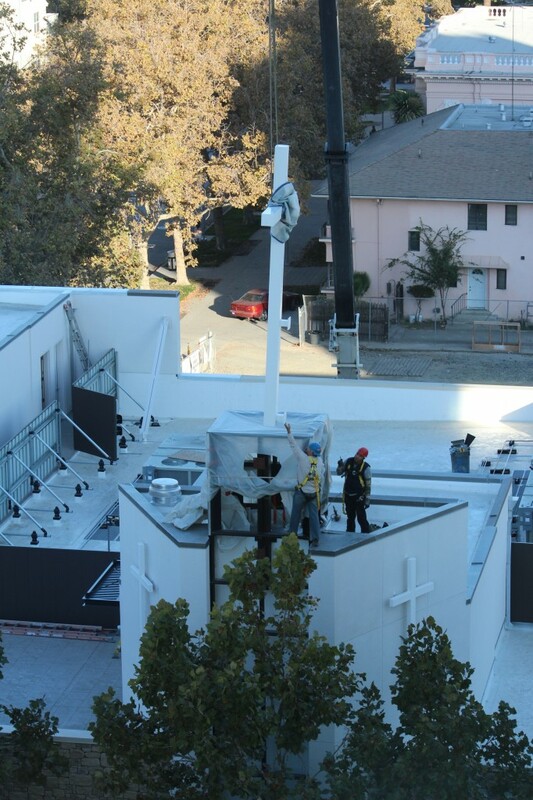 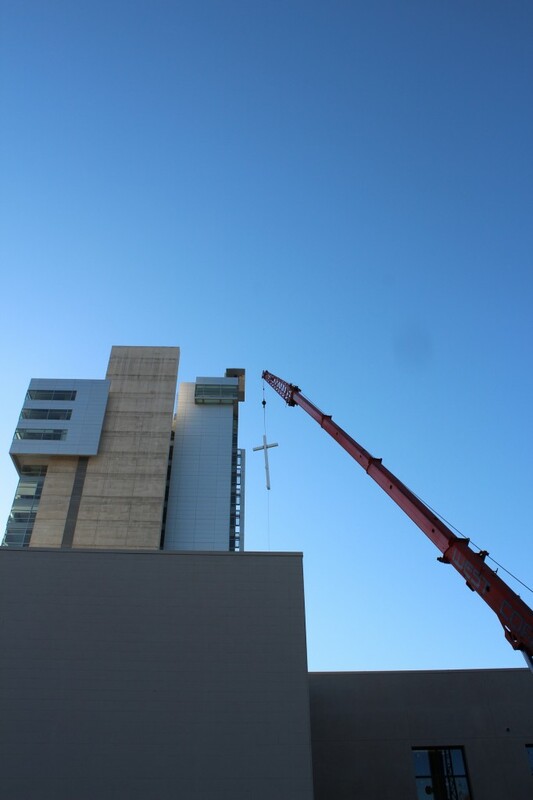 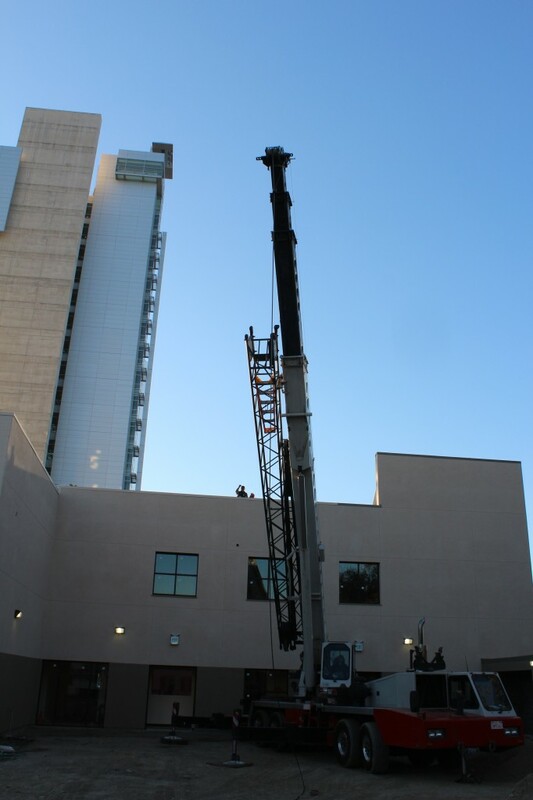 On Monday, October 14th a crane showed up at Church to install the Cross. Before that project the crane was used to put in place the last piece of the roof deck – a railing on the connector walk between roof terrace and the back stairways. 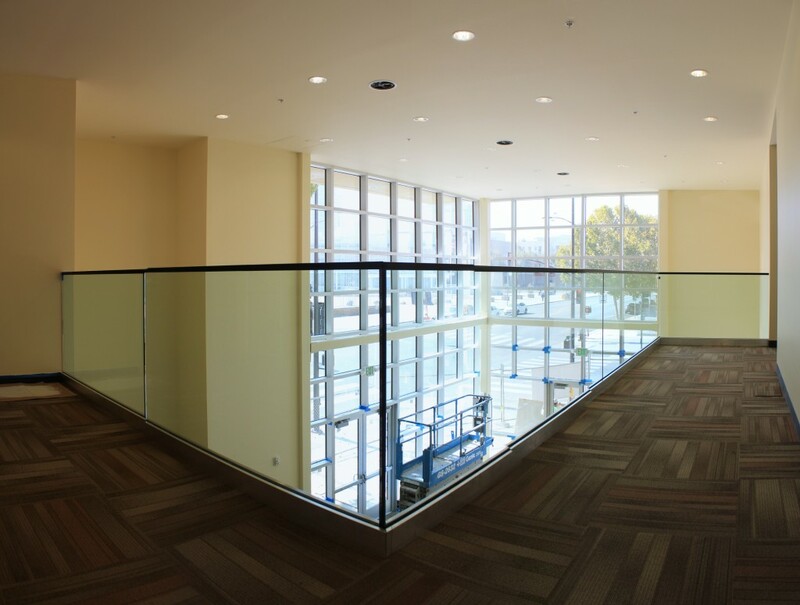 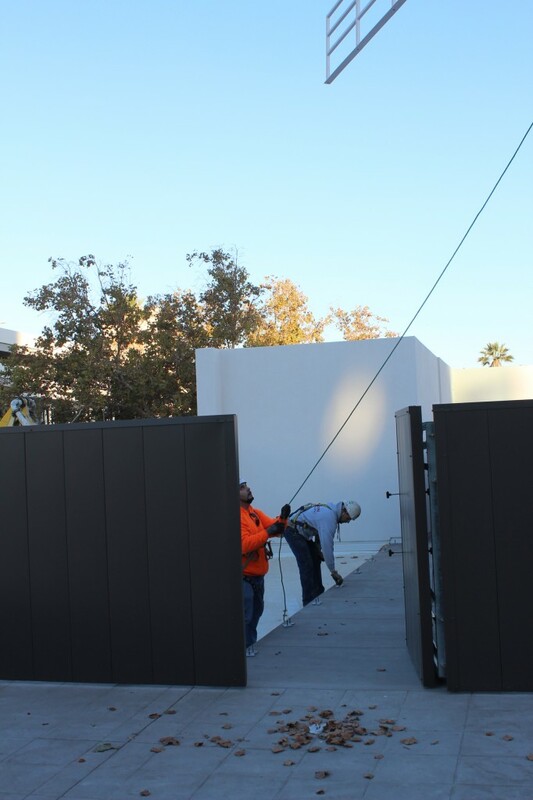 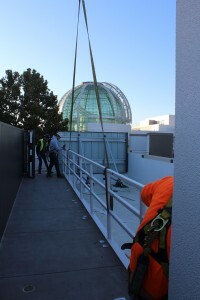 The pictures below were taken as the railing was raised into place. 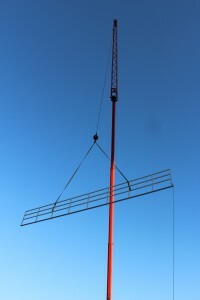 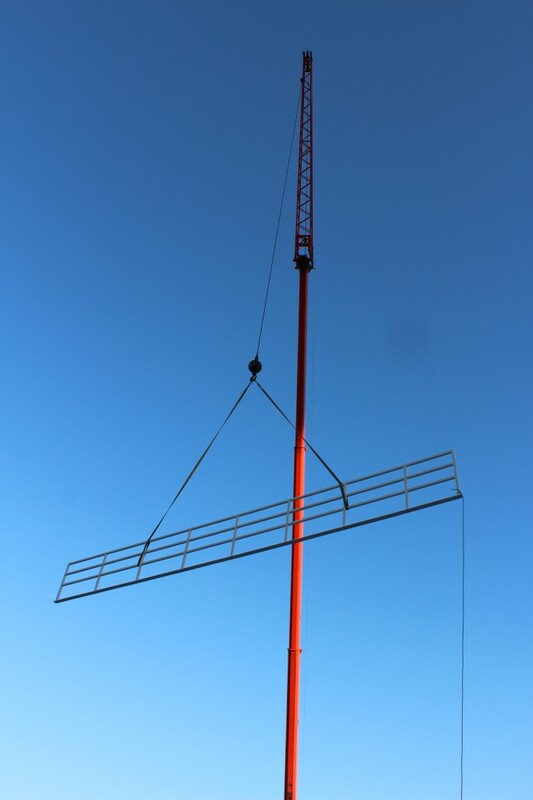 The first step was to assemble the crane and position it for the lifts. 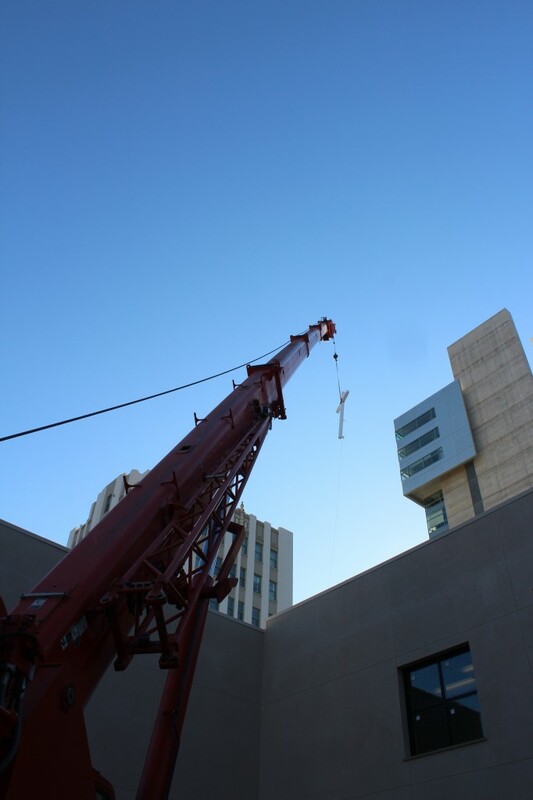 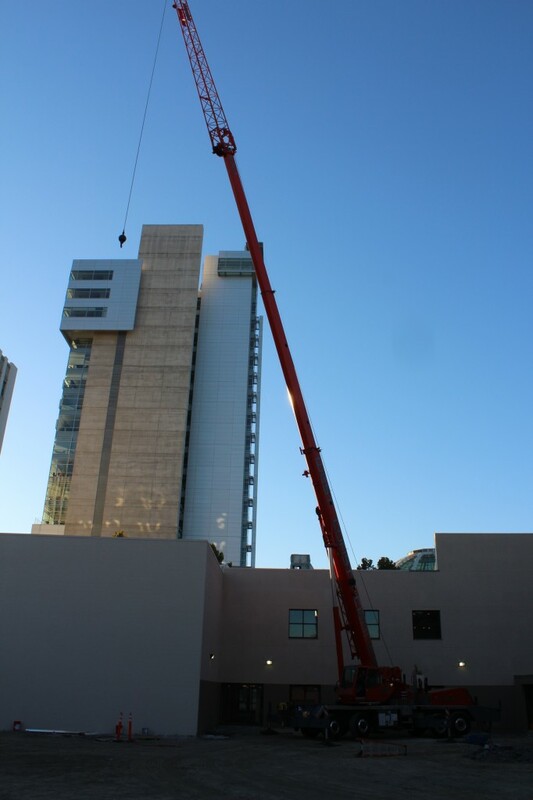 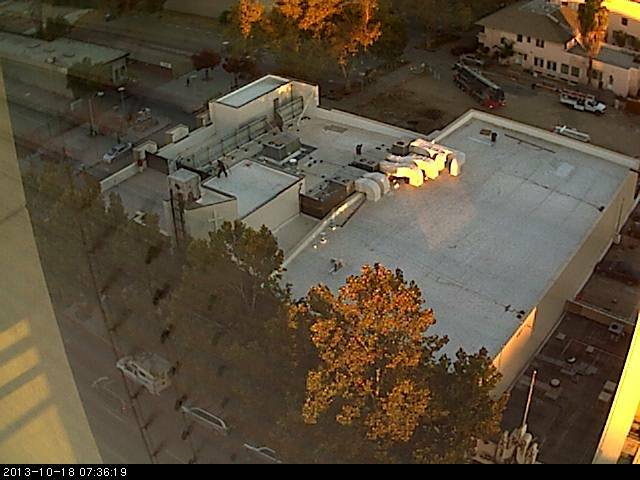 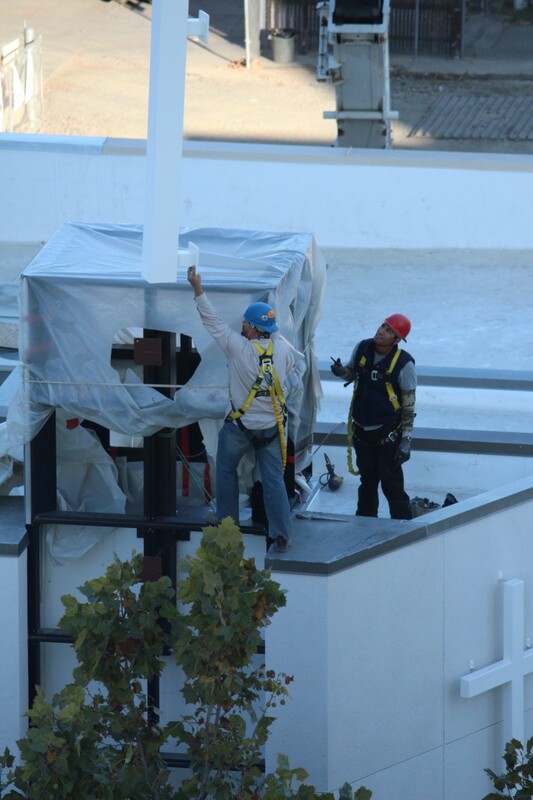 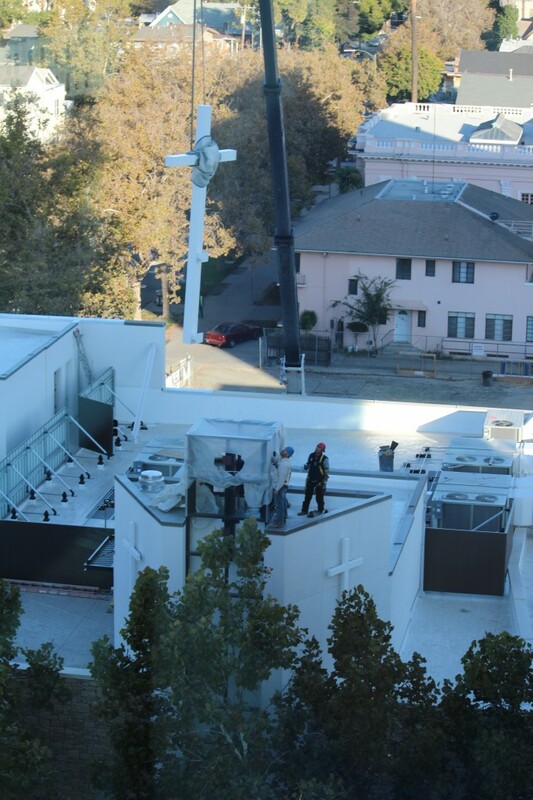 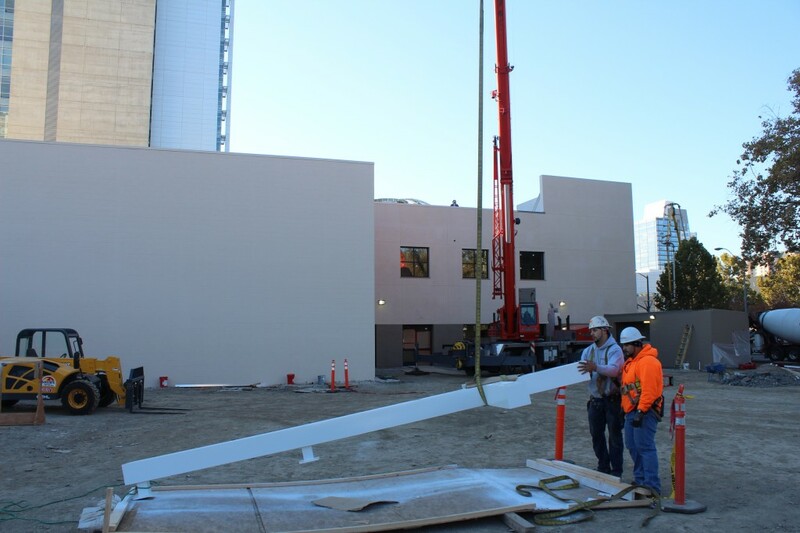 Once the crane was in place, the railing was moved from the staging area to the roof deck. 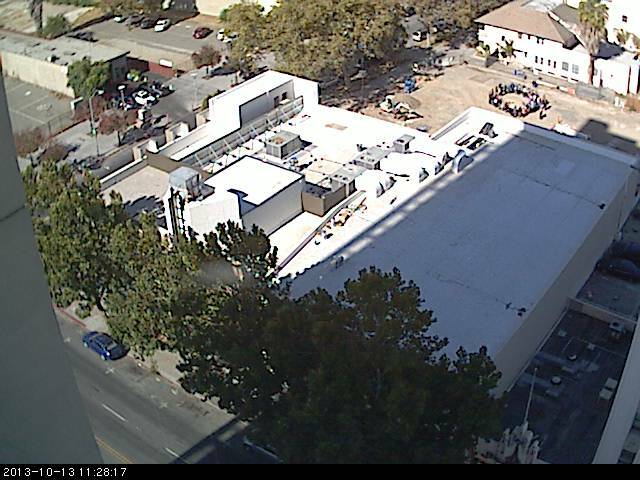 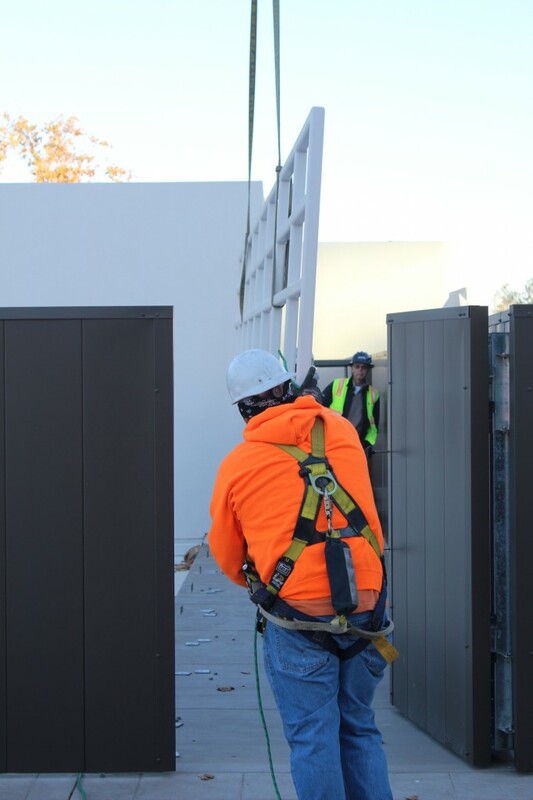 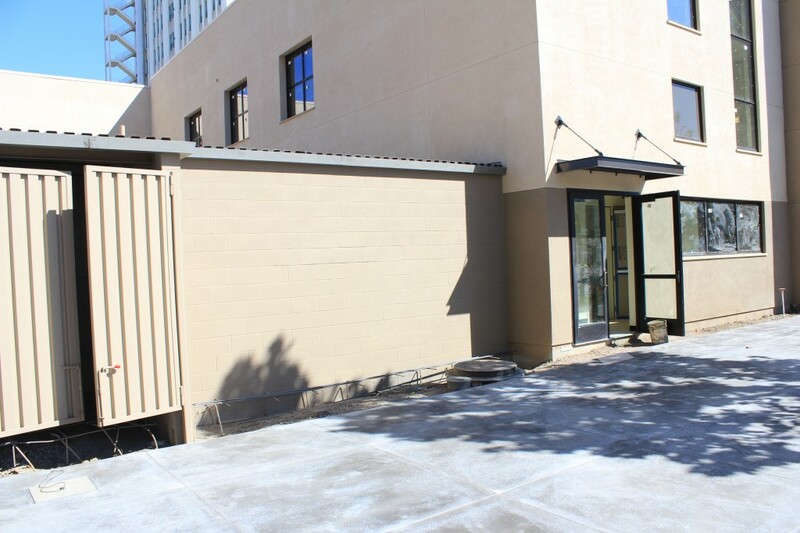 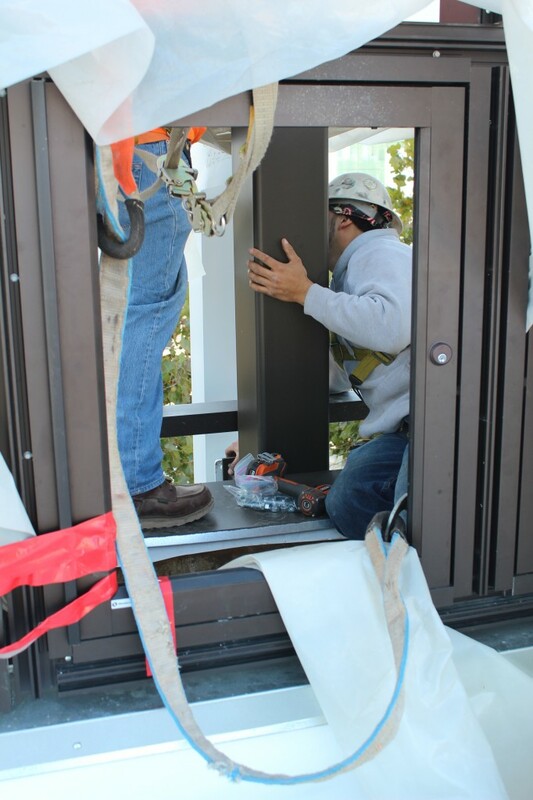 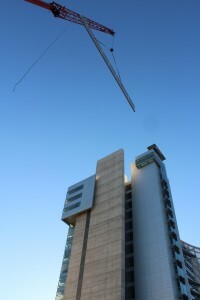 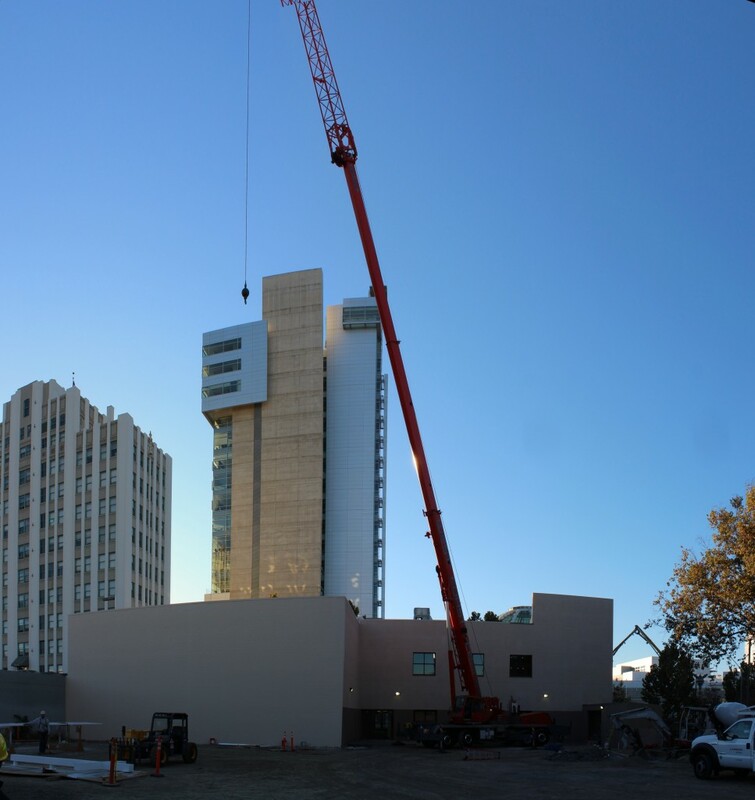 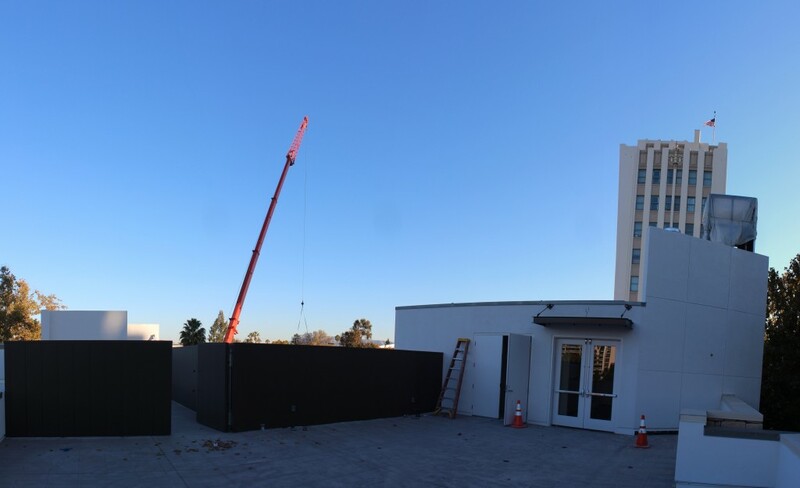 Previous blogs described the construction of our elevator from empty concrete shaft (http://sanjosefirst.com/elevevator-construction-begins/) to a working elevator – my first ride ! 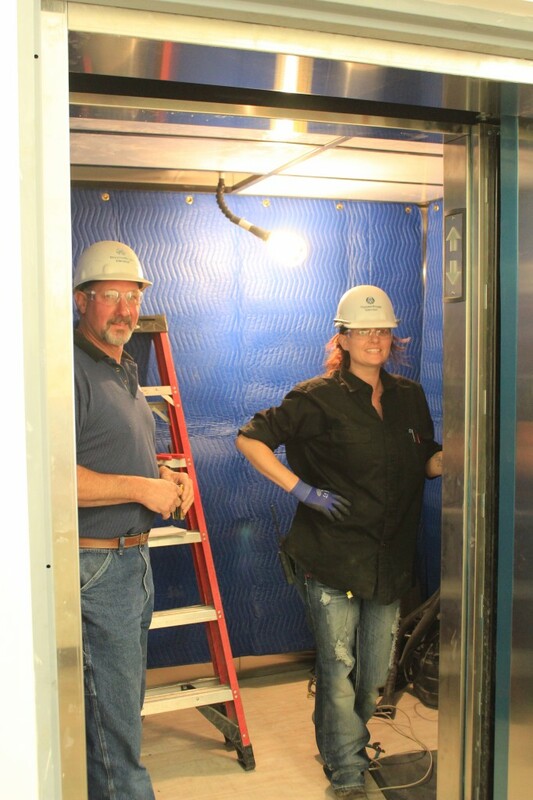 The ThyssenKrupp team has completed the programming and adjustment of the elevator and its ready for inspection, or will be soon. 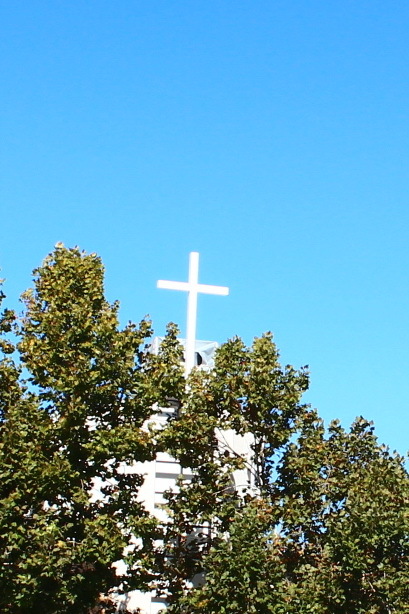 It is interesting that much of our early Church history was taking place at the time ThyssenKrupp was born through a merger of two German steel companies, Thyssen AG founded in 1891 and Krupp founded in 1811. 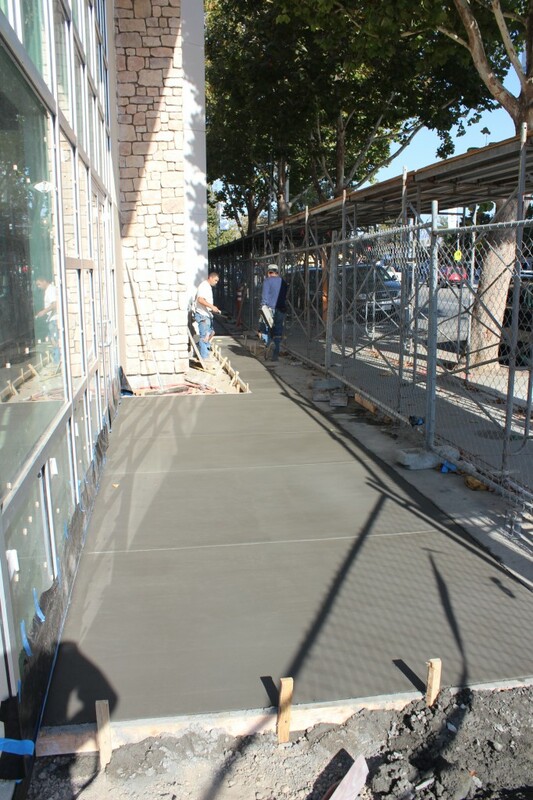 New sidewalks have been poured and the frames and re-bar for the bike racks are in place. 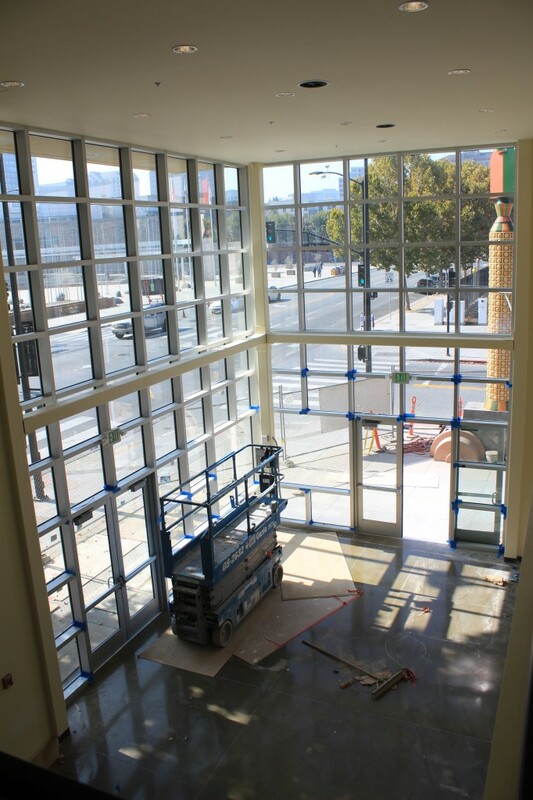 These pictures taken this afternoon show progress with AVL, sidewalk concrete and other interior spaces. 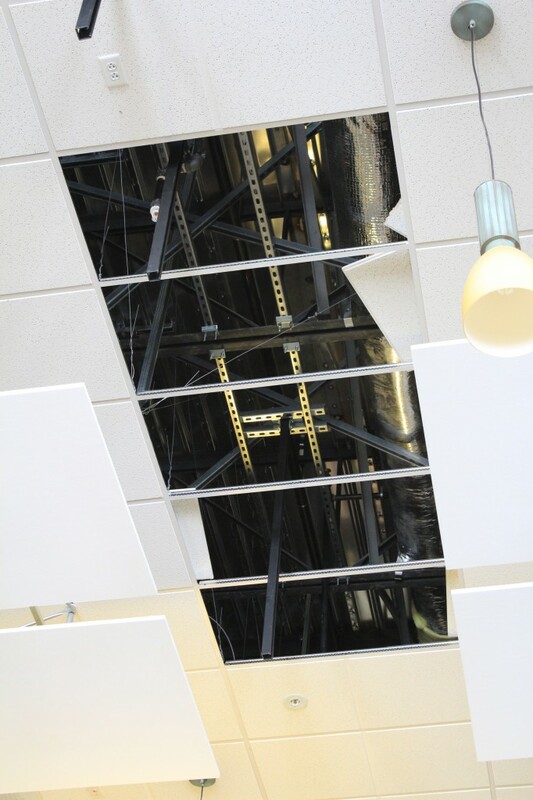 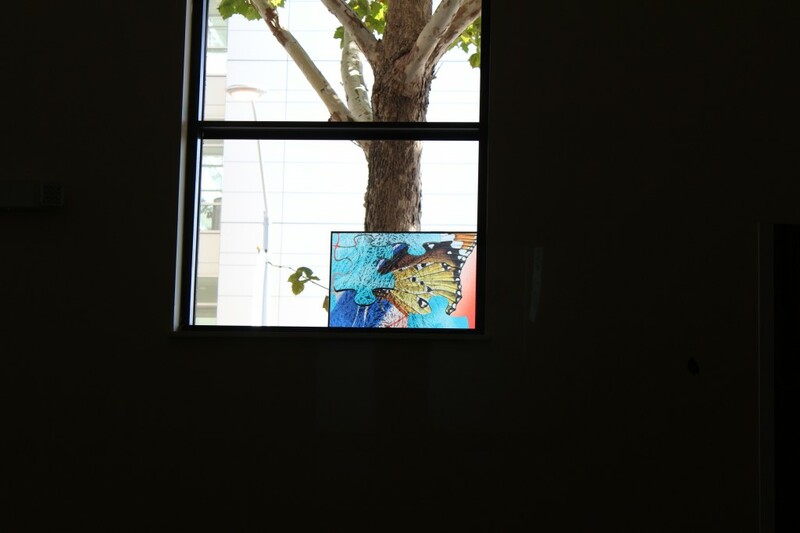 Much of the work for security, networking and AVL is behind walls and above ceiling tile. 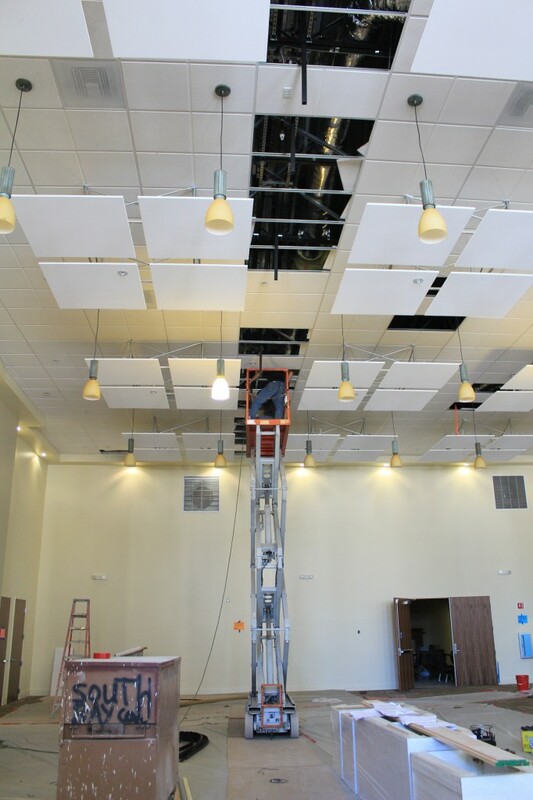 Work is underway on the light bars in the sanctuary that will support speakers and lights. 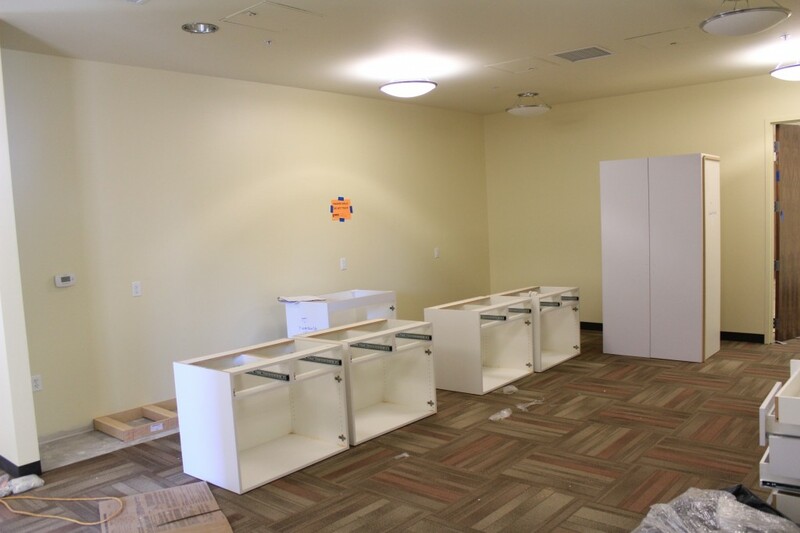 Cabinetry in the break room is being installed. 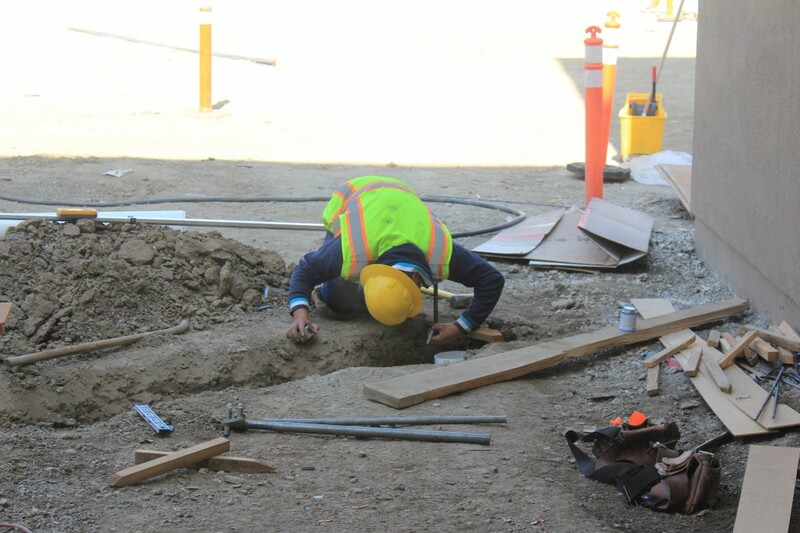 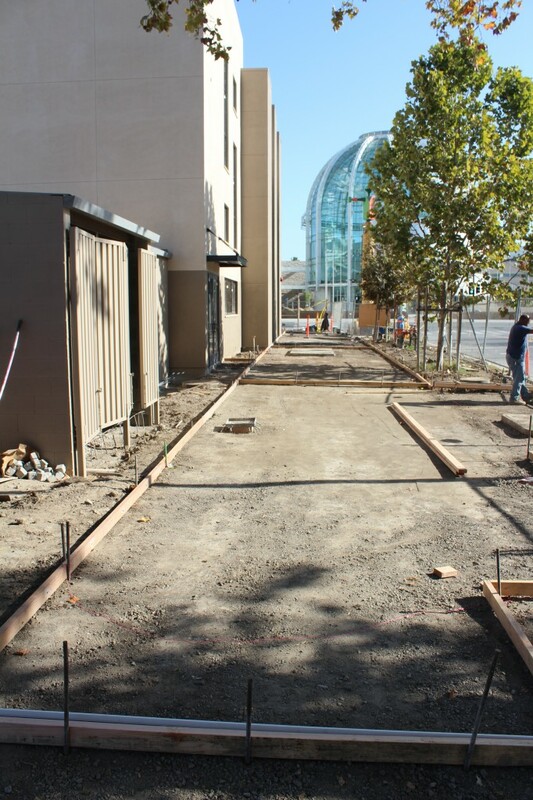 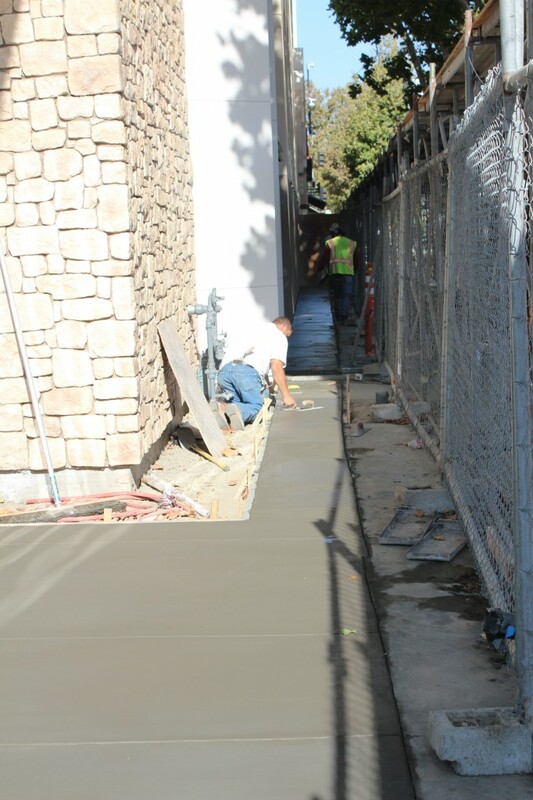 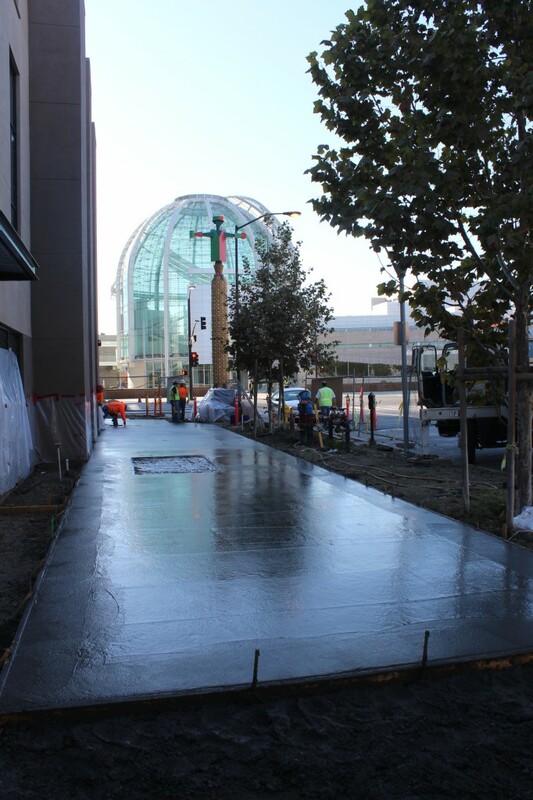 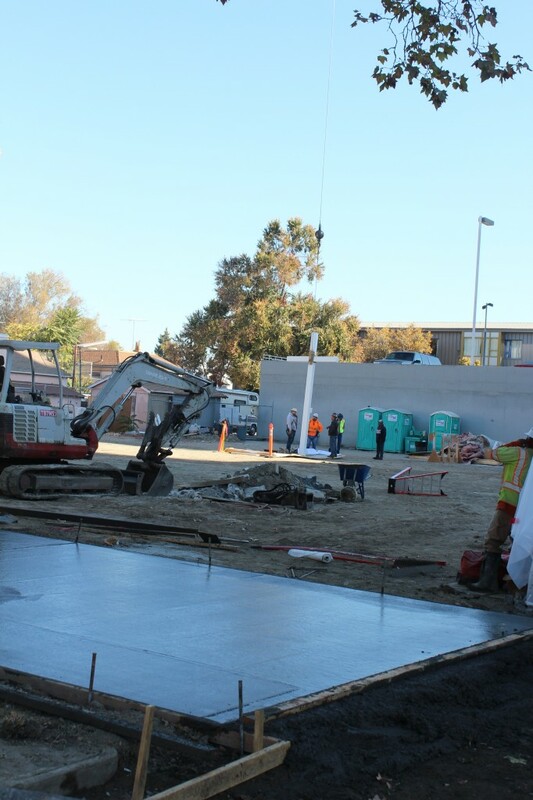 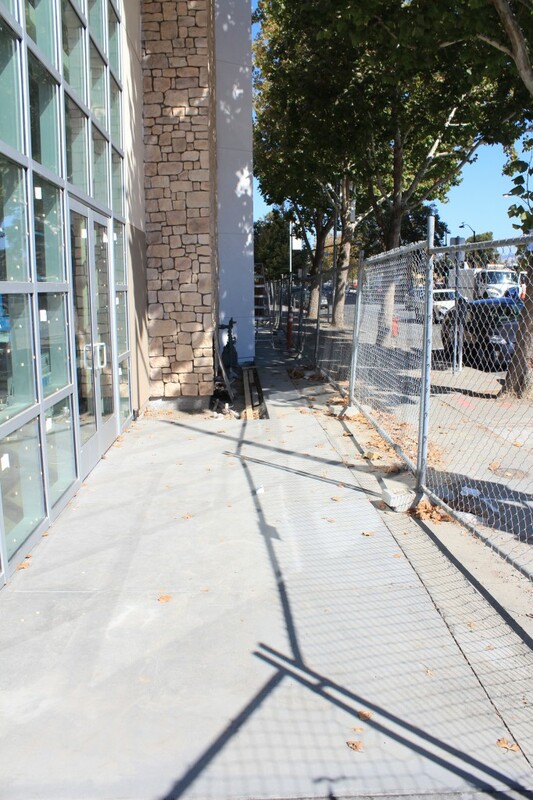 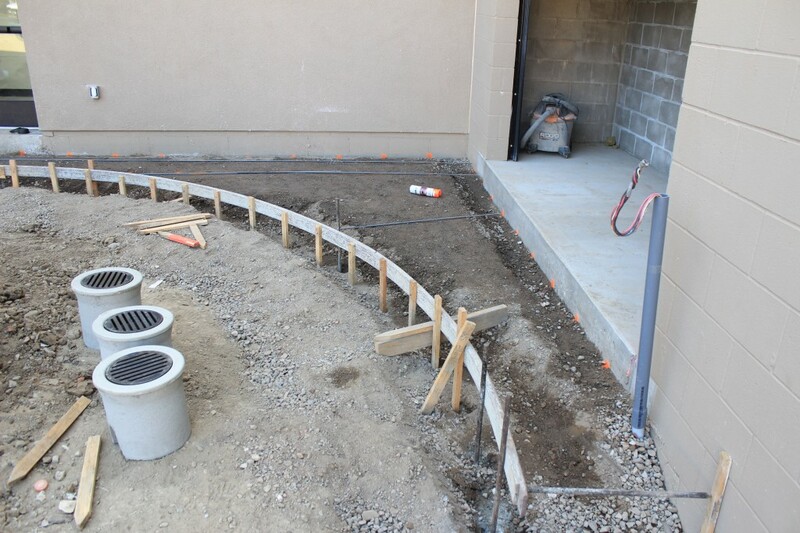 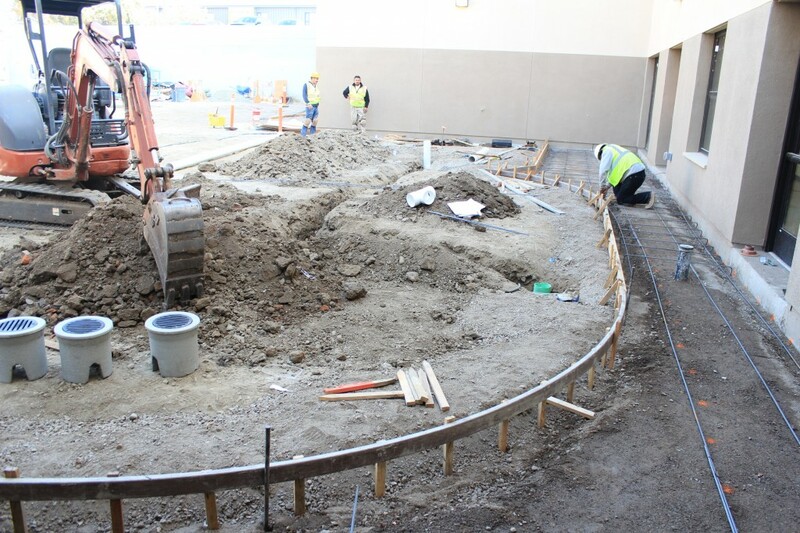 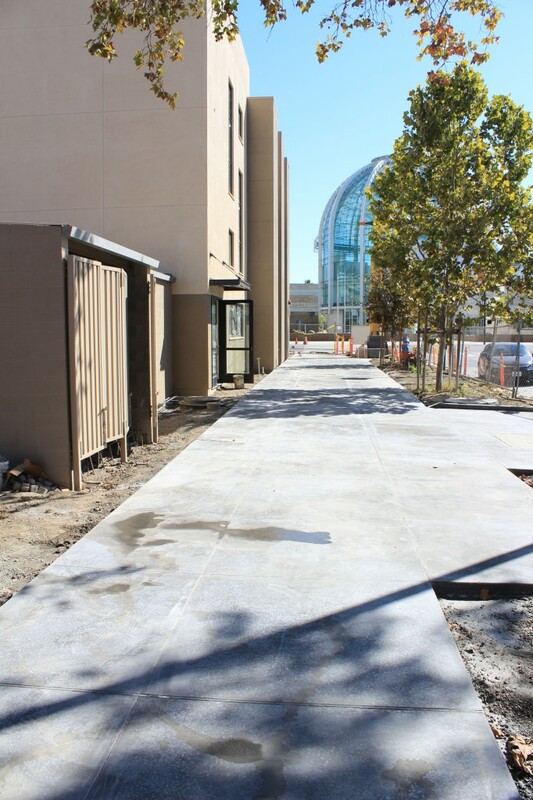 On the outside, concrete footers are in place for the western sidewalk and Santa Clara street sidewalks. 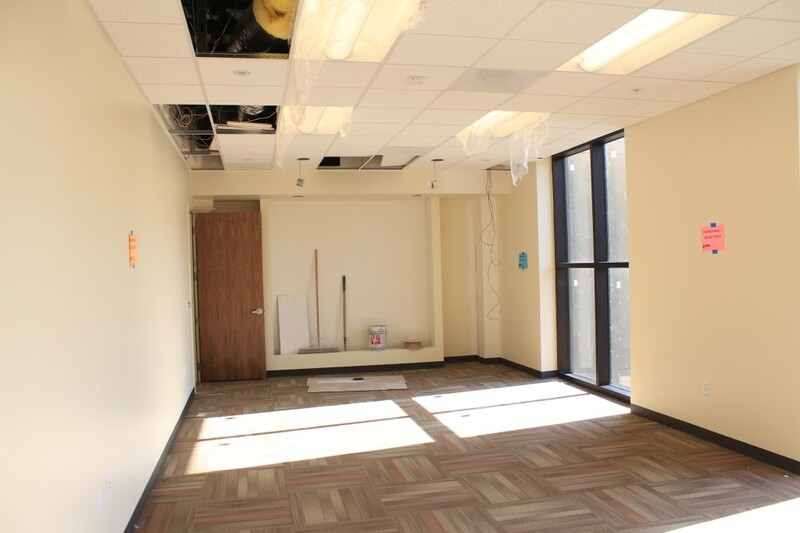 The western conference room is nearing completion. 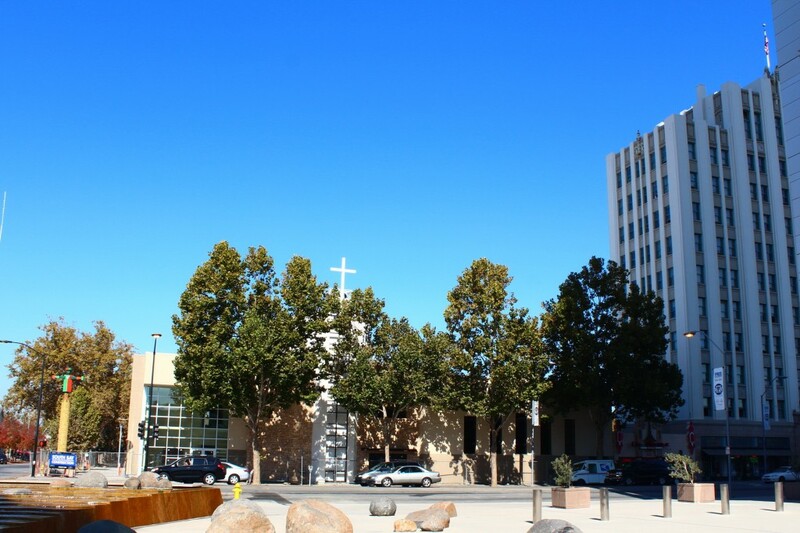 The south end will host the Gethsemane window. 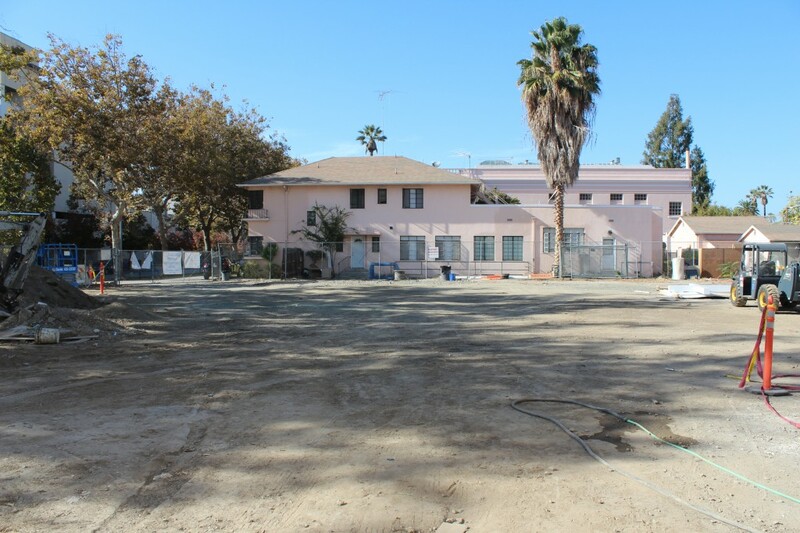 The construction trailer is gone as seen from these two pictures showing the empty lot that has served as a staging ground during construction.